Play of the game: Third-string quarterback Will Levis zinged a 59-yard touchdown pass/laser up the right sideline to speedster Dan Chisena to close the third quarter. James Franklin announced from his midfield microphone that Chisena “is now on scholarship,” and his teammates from both sidelines mobbed him. Offensive player of the game: Freshman running back Noah Cain played for both teams. He started out for the White and, going against the first-team defense, rushed for 41 yards on eight carries. He was not thrown for a loss. He also rushed four times for 4 yards for the Blue and caught two passes (one for each team) for 13 yards. He scored a touchdown for each team. Defensive player of the game: Linebacker Brandon Smith made six tackles and broke up a pass for the White. Most telling statistic: The first half, with a running clock, took 45 minutes. Hidden statistic: The Blue team is loaded with all the experience as its roster totaled 61 letters won compared to just two for the White, including one by kicker Rafael Checa. 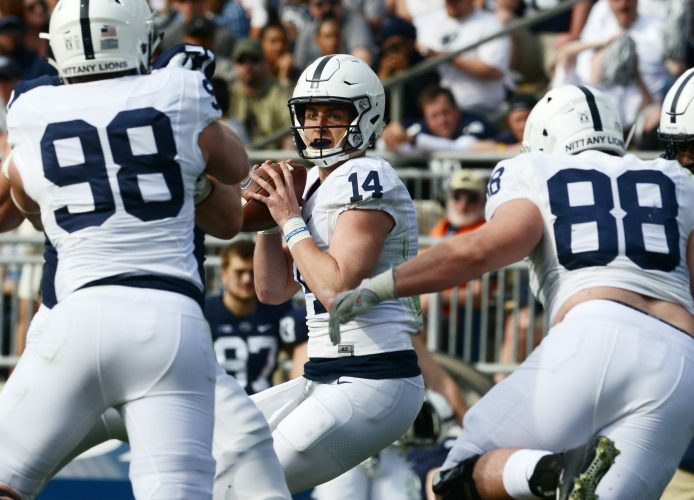 In six years of the Blue-White game under James Franklin, the White team has now scored three touchdowns. Best run: Cain broke a couple tackles on his 8-yard TD late in the fourth quarter to close the scoring. Best pass: See play of the game. Best catch: Tight end Nick Bowers went up to snag a 19-yarder from Sean Clifford in the first quarter. Catch it, will ya: Carrying over from last year, the receivers struggled early with Pat Freiermuth, K.J. Hamler and Justin Shorter dropping passes. Best kick: After a timeout, Jake Pinegar made a 35-yard field goal to end the first half. Best breakup: White cornerback Makai Self broke up a potential touchdown pass to Jahan Dotson in the end zone in the second quarter. It was one of two breakups for Self. Best tackle: White team linebacker Max Chizmar blew up a screen to Isaac Lutz in the fourth quarter. Best moment: BTN broadcaster and ex-Lion standout Matt Millen, coming off heart-replacement surgery in which he was hospitalized for several months, was introduced to the crowd and drew a rousing standing ovation. 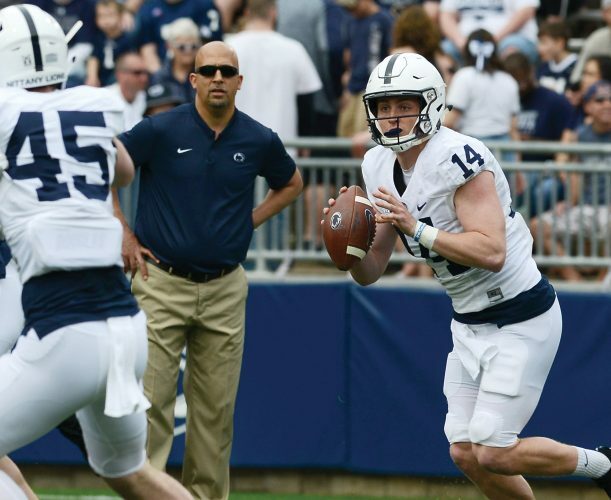 Halftime highlights: Some of PSU coaches from other sports took part in the competition of fielding punts at halftime, including new women’s coach Carolyn Kieger, who used the window to return one all the way for a touchdown.